Just picked up a SB Z card and tried to get it working under Arch with zero success. 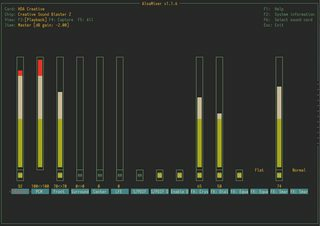 I can't get any sound out of any of the outputs. It works perfectly under Win10 however so the HW is not the issue. I've disabled the internal soundcard inside of my BIOS to reduce the confusion. Only the HDMI output from the Nvidia card and the SBZ are present now. I've also installed alsa-firmware package but that didn't help. device.description = "Monitor of GP104 High Definition Audio Controller Digital Stereo (HDMI 2)"
alsa.long_card_name = "HDA NVidia at 0xef080000 irq 17"
device.product.name = "GP104 High Definition Audio Controller"
device.description = "Monitor of Sound Core3D [Sound Blaster Recon3D / Z-Series] Analog Stereo"
alsa.long_card_name = "HDA Creative at 0xef804000 irq 19"
device.product.name = "Sound Core3D [Sound Blaster Recon3D / Z-Series]"
Anyone have one of these working? Anything I can try? The drivers for these are notorious for being buggy and not working properly, only a handful of Alienware built-ins have the proper pin layout tables to work correctly. That's interesting, it does contain the usual, but it never occured to me to omit the ca0132 driver and using the generic HDA, so that might be another interesting bit, though it reads like that wasn't as successful either. On my system the soundblaster was the onboard card. After a few weeks of attempting to find a working solution I switched to a Xonar DGX (which also was in a sale and also around 30$ coincidentally) and haven't had an issue with that. Videl, look what I just came across: http://forums.creative.com/showthread.php?t=742256 someone wrote a new driver for it (plus a driver for Recon3D on Gigabyte mobos). Looks like the driver is only few weeks/days old too. Requires patching the kernel and a new recompile. I'll give this a try when I get home. Update: I have everything working now! SBZ card now works PERFECTLY under Linux thanks to Conmanx360's patch! Headphone output, S/PDIF etc. ALSA, PA... it all works. Big thanks to Conmanx360 for tracking down the issue I had (I had a board with a different revision number). Now... how does one get this patch into the Kernel?! Sweet!! Thanks for letting me know. I'm glad the author managed to get it approved! Just built the latest core release 4.17.3 with patch_ca0132.patch, and I can happily confirm my SoundBlaster Zx is now fully working! Thanks Conmanx360 and Batou, great work! Excellent. Just one note... the author told me that the Creative gave him the right to redistribute firmware so it will land in linux firmware at some point around 4.18 release. It might conflict with the one you have now so if you get the error from pacman about it, just delete it and then install the package. Thanks, I've built the kernel with a custom pkgbase, so it doesn't interfer with the stable -ARCH stock package. It's just a little hassle to rebuild the kernel each time, and rebase the patches on top of the latest stable version. Although good news, 4.18 is on rc7, and Linus has said it should be the last release candidate, so hopefully shouldn't be too much longer now. And it works in my ZXR sound card. The only problem is that I can't load alsamixer controls (it gives an argument error) and I can't redirect the sound to my headphones (i need to look forward). However, I'm glad to have sound from my card. This must be the holy grail, big thanks Conmanx360 and Batou! Im using a Gigabyte G1.Sniper Z97 with a Sound Blaster Recon3Di onboard-soundcard. Like every year, I tryed to get the sound of the Recon3Di working on linux with no success. So, I installed Antegros and the "test_patch" from the AUR, but it didnt fix the problem :-( . Now I'm compiling the newest version of the mainline kernel 4.18-rc7, wich includes the patch for the Recon3Di and then I'll try my luck again. Is there any resources, where somebody is getting sound of his Recon3Di using linux? Im looking forward for any new information, to get this soundcard finally working on linux . That looks to me like the patch that Voron00 made some time ago to handle it as generic audio. So, that's good for the ZxR, although not for the R3Di. 3agl3, the reason it isn't working is probably because you're using the wrong patch. My patch uses GPIO to enable the headphone amp, which is why yours is probably so quiet currently. You may need to get the proper one. Just registered here after being sent this thread. So, hopefully you can get the current kernel working version, 3agl3, and let me know how it goes. Edit: Oh, I'm silly. Just realized 3agl3 was the one who sent me the email. Disregard this. HeadPhone Output (using 1/4 inch input jack). Alsamixer panel to configure outputs. The third one is an error when I choose the card in alsamixer to configure audio values. It's strange because the 3.5 jack output is working well and the microphone input using 1/4 inch jack works too (but I need to configure the volume too hight). The following lines contains information using OP commands. device.description = "Monitor of Sound Core3D [Sound Blaster Recon3D / Z-Series] (SB1570 SB Audigy Fx) Estéreo Analógico"
alsa.long_card_name = "HDA Creative at 0xdf104000 irq 17"
device.product.name = "Sound Core3D [Sound Blaster Recon3D / Z-Series] (SB1570 SB Audigy Fx)"
device.description = "Sound Core3D [Sound Blaster Recon3D / Z-Series] (SB1570 SB Audigy Fx) Estéreo Analógico"
Looks like Sound Blaster Recon3D cards will get official support in 4.19 (which won't be long way from 4.18)... thanks to Conmanx360! 4.18 has full Core3D support and it should be released today (I think). Won't be long before it's in Arch. Thanks for the information and for the hard work. Currently I have installed the kernel 4.18.5-arch1-1-ARC. The soundblaster ZXR card is recognized and the alsamixer shows the following control panel. So, the card seems to be working, the microphone detects sound but I can't obtain sound from the card. I tried to configure pulseaudio sound server but it says that the headphones and the line out are unplugged. Any clues? if ypu need logs please tell me. You'll need to compile the latest patch_ca0132.c file from my Google Drive if you want to get it working. I have been meaning to set up some sort of DKMS thing, but I haven't had time to fully figure it out yet. Link to Google drive: https://drive.google.com/open?id=1JTo9l … fQrjchf0fX It's on the GitHub page, but just incase you missed it. Thank you very much!!. I will track your GitHub work. I have the same problem as you did, running an ZxR Soundblaster just like you, alsamixer cannot load the cards controls/ gets an Argument Error. However it seems you got that fixed, could you tell me what you did? Currently, i only did load the AUR package. The fix is in the newest kernel, 4.20. Not sure if Arch has a way to upgrade to it, so you might need a DKMS archive. What kernel version are you on? Sorry, took a while to come back to the forums. I am on kernel Version 4.19.4 As a rolling release, arch should automatically roll the new kernel version out with pacman -Syu, should'nt it? If you are that curious you could give https://aur.archlinux.org/packages/linux-mainline a shot. I just wanna give a huge shoutout to Conmanx360 for what is now fully working ZXR support in Linux 4.20 (which has officially made it to Arch a few days ago). Seriously dude, you rock! I've been waiting years for this. Do you accept donations via Paypal or similar? I'd love to throw a little appreciation your way. Donation links can be found in the Reddit thread I'm using to keep all this stuff in one place, I have trouble keeping track of all the forum posts scattered all around. The reddit thread can be found here. In case anyone is looking for help, I'm probably more quick to respond over there.